Is hockey more important than a trip to ER? A new Canadian study shows that in a hockey-mad country like Canada, people are willing to put off a trip to the emergency room to watch an important game. The study found that ER visits fell dramatically during last year's men's gold medal Olympic hockey game, suggesting that a major event may influence whether patients decide they are sick enough for such a trip. The idea for the study was sparked by a slow night in the emergency department of Toronto's Sunnybrook Health Sciences Centre during the men's gold medal game last February, the most-watched television broadcast in Canadian history. Dr. Donald Redelmeier wondered if his quiet night at work was a fluke, or if ER doctors across the province had also had an easy shift, so he analyzed data from 150 Ontario hospitals. Redelmeier's research, conducted at the Institute for Clinical Evaluative Sciences, found a 17 per cent drop in emergency room visits across the province during the game. That translates to more than 136 fewer patients per hour at Ontario hospitals. "Our study is not about one exciting event. Instead, the point is about the other 365 days of the year," Redelmeier said. 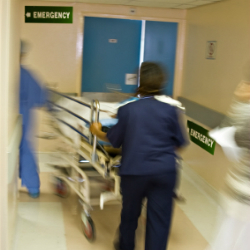 "Namely, emergency department overcrowding is often blamed on suboptimal physicians, administrators, or computer systems. Our study suggests that another large contributor is patient preferences." Not only did the big game correspond to a big drop in ER visits, but it would seem that patients decided they didn't want to miss the drop of the puck or the final buzzer. Researchers say that emergency visits were also down before and after the game. And while women also made fewer ER appearances that day, the most marked decrease was among middle-class, middle-aged men. But the excitement of the game may yet have proved too much for some fans, as researchers discovered a small increase in cardiac emergencies. However, hospitals experienced the most significant drops in patients suffering from abdominal pain, joint pain or a major trauma. The study is published in the June 14 edition of the journal Open Medicine. Dr. Simon Kingsley of Toronto's St. Michael's Hospital said the findings confirm what emergency room doctors have long suspected. "That is, when it is an inconvenient time for a patient to come into the emergency department, they don't," Kingsley told CTV News. Kingsley points to the fact that patients did not come rushing into the ER after the game as evidence that generally speaking, some patients head to emergency with symptoms that end up dissipating on their own. "It basically says there are things that present to the emergency department that are not true emergencies," he said. Which suggests that many of the ailments that send patients to emergency rooms are not worthy of a hospital trip at all, and efforts should be made to divert those patients to walk-in clinics and doctors' offices, Kingsley said. While the benefits of armchair athletics have long been limited to the joy and the agony of watching one's team win or go down to defeat, the study points to an unexpected benefit: reducing health care costs. Researchers say that a sustained 17 per cent reduction in visits to the emergency room would save approximately $100 million per year. "Efforts to reduce health care costs need to consider the choices that patients make for themselves," Redelmeier said. "Economic analyses need to be informed by insights from behavioral science."